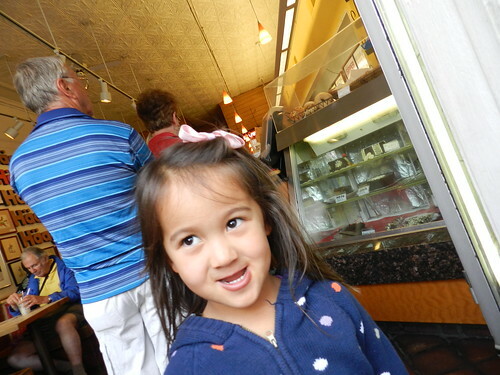 Mali Mish – Day 6: Santa Fe Bound. Day 6: Santa Fe Bound. Today is our last full day at the Balloon Fiesta and we woke up to an amazing surprise. 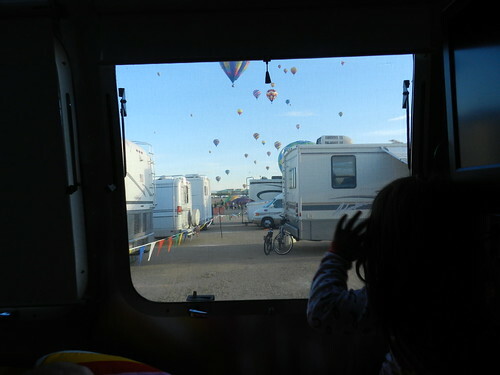 Since we saw the balloons at the fields yesterday morning, we didn’t know how we would see them from the campsites. 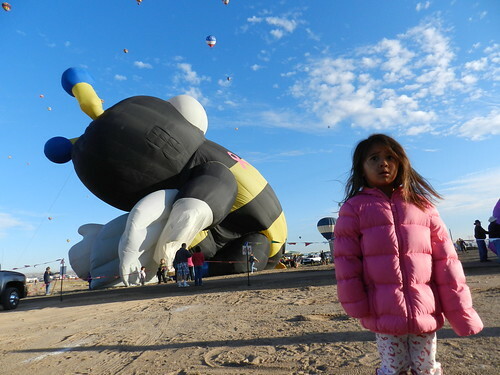 After rolling up our window shades, we saw hundreds of balloons in flight headed in our direction. We headed outside still wearing our pajamas and winter coats to get a closer look. The prevailing wind direction of this area blows the balloons south as they ascend. Shortly after they clear the mountain ranges, they typically make a 90 degree turn and begin to head west. Today however, the westerly winds did not prevail and all of the balloons headed south and right over our heads. Because of the direction they are headed, they have to decide to either make an early landing or continue on so they don’t end up near the center of town. Many of them decided to drop down right next to us. Here the bumble bee makes a not-so-graceful return to earth and Ava was just a little concerned for herself. Since today was our last full day here in New Mexico, we wanted to do some exploring. Our last time through Albuquerque we visited the historical old town and the eccentric Tinkertown. We never made it to nearby Santa Fe so that was the plan for our afternoon. 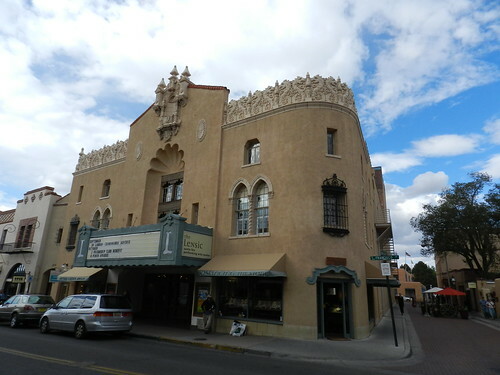 Santa Fe is a medium size town about 70,000 people and is also the state capitol of New Mexico. It is known for its arts and crafts as well as the adobe architecture. Originally occupied by the Pueblo Indians, it tries to preserve much of the original native artifacts that was not destroyed during the Spanish invasion. After the hourly drive from Albuquerque to Santa Fe, we were starved. 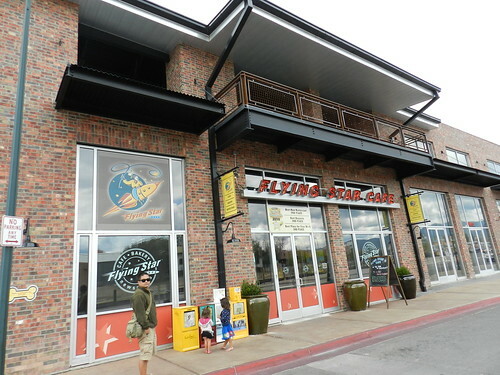 We knew they were also known for great New Mexican food but didn’t have any good recommendations on where to go. Instead we found a Cafe/Deli next to the train station that looked promising so we stopped in there. 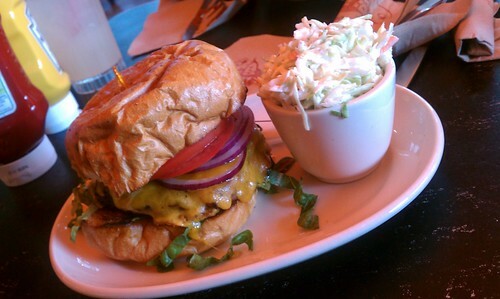 Turns out, this place has amazing burgers and sandwiches. These weren’t queso-drenched tortilla chips we were looking for but it was equally satisfying to our taste buds. We headed out for the old town square after lunch and found a little fajitas stand but we were much to full to be able to partake. But the Haagen Daaz across the street is a different story. There is always more room for ice cream. 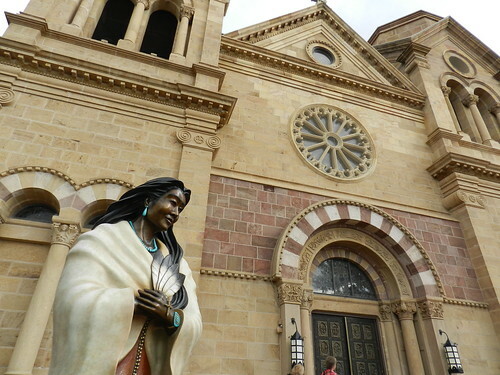 Santa Fe has all the great southwestern architecture you come to expect from this area. 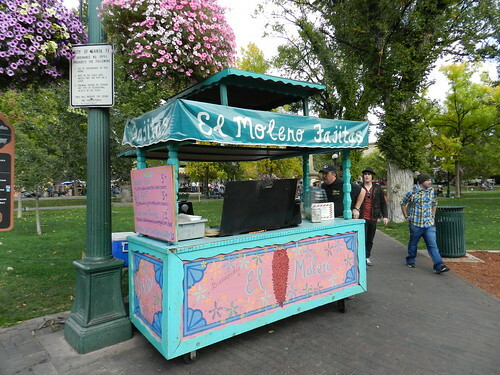 It seems to be much more authentically kept to its Spanish colonial origins than Albuquerque. This beautifully restored theater near downtown is just one of the examples. And of course the burros. 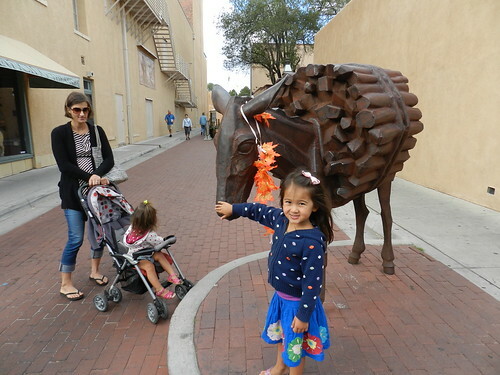 Ava was especially fond of this one at none other than Burro Alley. She’s not scared to pet it since it doesn’t have huge chompers to gnaw on her fingers with. If we could have waited, I bet Burro Alley Cafe would have been a nice lunch spot. Maybe next time. 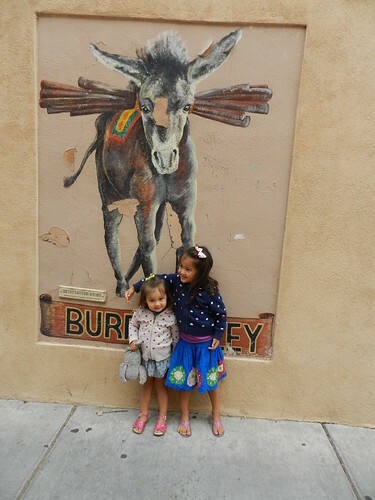 We will just have to settle for the painting of the burro on the wall. 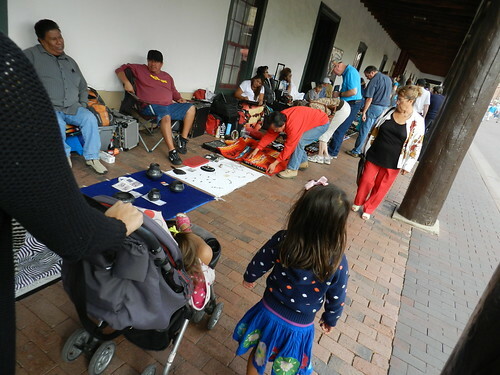 Along the old town square, there are a ton of authentic native American vendors hawking their warez. We were lucky to get out of there without spending our life savings. 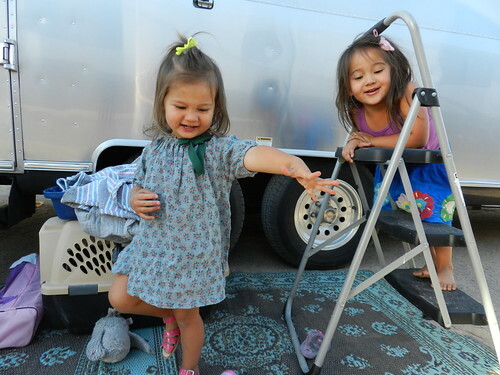 Ava loves looking at all the handmade jewelry and would buy them all up if she could. This is the inside of the St. Francis Cathedral Basilica. It is beautifully restored but after seeing Sacred Heart and Notre Dame in Paris, we are pretty hard to impress. By now Ava has gotten to know the drill pretty well. 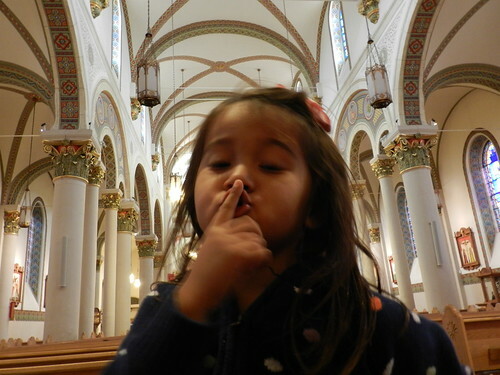 No talking inside the church. Don’t tell me, tell my screaming little sister. Ok, it is pretty nice. France or not. Tomorrow we head out of Albuquerque westward again. Slowly making our way towards home. Very slowly. Day 5: Mass Ascension of Hot Air Balloons.